Dans cet article, j’analyse l’émergence de leaders Rom à Rome, une nouveauté qui a accompagné la mise en œuvre du Plan Nomades par l’administration Alemanno, dans le contexte de la déclaration d’urgence nationale concernant «les implantations de communautés nomades» en 2008. Suite à la littérature scientifique sur la participation des migrants, je pars d’une analyse des documents de politique présentés par le nouveau maire, puis je me concentre sur l’expulsion de l’un des plus grands et plus anciens camps de nomades à Rome, celui de Casilino 900. Cette étude de cas nous permet de détecter les conséquences concrètes du plan et comment un leadership Rom gagne en visibilité et est reconnu par la municipalité. Enfin, il sera possible de reconnaître la persistance des «campi sosta» comme le modèle des politiques de Rom à Rome, un élément pertinent de la continuité entre le gouvernement Alemanno de la ville et ses prédécesseurs de l’aile gauche, un modèle que les nouveaux dirigeants Roms acceptent. In this article I analyse the emergence of Roma leaders in Rome, a novelty which has accompanied the implementation of the Nomads Plan by Alemanno's administration, within the context of the declaration of a national emergency concerning “nomad community settlements” in 2008. Following the scientific literature on migrants' participation, I start from an analysis of the policy documents presented by the new Mayor; then I focus on the eviction of one of the oldest and biggest nomad camps in Rome, Casilino 900. This case-study allows us to detect the concrete consequences of the Plan and how a Roma leadership gains visibility and is acknowledged by the Municipality. Finally, it will be possible to recognize the persistence of “campi sosta” as the template of Roma policies in Rome, a relevant element of continuity between Alemanno's city government and his predecessors of the left wing, a template that the new Roma leaders accept. 1The aim of this article is to analyse the emergence of Roma leaders in Rome, a novel development which has accompanied the implementation of new local policies following the Italian government’s declaration in 2008 of a state of emergency concerning “nomad community settlements Les migrants roms dans les villes françaises et italiennes : mobilités, régulations et marginalités”. 2While the participation of Roma leaders has been widely studied, especially within transnational institutions and NGOs and in Eastern Europe (Sigona and Trehan 2009, Vermeersch 2006, Klimovà-Alexander 2005, Guy 2001), in Italy the interest in this topic is recent, even if growing1. This delay of studies is a concern for at least two reasons: on the one hand the Roma issue in Italy has been one of the main themes in public debate on immigration and urban security policies, a debate in which Roma voices have rarely been heard; on the other hand, Roma living in Italy, both Italian citizens and foreigners, have created many associations and networks in the last five years, challenging the stereotype which views them as passive and uninterested in political confrontation. 3The issue of Roma participation concerns and links several scholarly debates. First, in accordance with the long tradition of public policy studies, we have to consider the construction of political subjects, their acknowledgement and their possibility of action as a part of the implementation process of policies at the local level2. Then, focusing on migrant participation and rephrasing Ralph Grillo (2006, p. 50), these items concern the dynamic between the politics of recognition carried out by public authorities, and the politics of differences as articulated by minority groups. It is a dynamic that defines the instruments through which the voice of a minority group can be heard in the Italian political arena. 4In the anthropological literature these items have been conceptualized in the theoretical framework of the “anthropology of policy” originally set out by Shore and Wright (1997). This ethnographic perspective, considering the implementation of policies as a social process in which cultural factors intervene, allows us to “examine how policy recipients – including subalterns and dissident groups – engage with and impact on the life of a policy” (Però, 2011, p. 223). It raises, and tries to answer, the question “How do policies construct their subjects as objects of power, and what new kind of subjectivity or identity is being created in the modern world?” (Shore and Wright 1997, p. 3). 5Within this theoretical context, I focus on the forms of construction and acknowledgement of romanì political actors within the local arena, and on their capacity to achieve goals on both of the levels highlighted by Spivak (1988): the discursive level, where the presence and the identity of the Roma (subalterns) is defined, and the concrete interactions between the authorities and minorities. My argument is that the participation and the visibility of some Roma leaders in Rome, rather than creating a political debate within the Roma communities and giving the chance for negotiations, or conflicts, with local authorities, risk becoming a tool to be used by policy-makers. 6According to various scholars (Cinalli and Giugni 2011, Vermeersh 2006, p. 38-44; see also Però and Solomos 2010), the “political opportunity structure” of the host society and the “discursive frame” in which migrants are defined and define themselves, are key factors which define how migrants participate in the political arena. It is therefore appropriate to start with a brief account and analysis of the policy documents introduced by the national government and local authorities. The study then examines the eviction of the Casilino 900 camp in Rome in February 2009: this case-study provides the context for detecting the gaps between policy plans carried out by the Municipality of Rome and the concrete consequences of these policies; furthermore, the events leading to the demolition of the camp were the scenario within which some Roma leaders began to act as interlocutors, creating a new means of interaction with local government. 7Data used in this paper come from interviews with Roma leaders, representatives of the institutions and members of local NGOs, and from participant observation in those situation which Abélès defined as “the places and the moments of politics” (2001), such as assemblies and meetings during which the Roma were informed and had to discuss the proposals and the decisions of local authorities3. 8In the last four decades, Rome, as the largest Italian city, has been one of the main centres of attraction in Italy for Roma migration: the first groups started arriving from different regions of former Yugoslavia from the end of the '60s. However, the Roma issue firstly became a topic of public debate in the city during 1986 and 1987, when citizens organized protests against the presence of Roma people in their neighbourhood (Karpati 1988). 9If we consider the policy plans issued by the different mayors of the city from 1986 (Signorello in 1986, Rutelli in 1999, and Veltroni in 2006 ), we can argue that the main item, both for the right and the left wing governments, has always been the location of the Roma. Following Legros, “space can be considered as the alpha and the omega of the emergence and the management of the Roma issue” (2011, p. 167, my translation), within the global re-dislocation of social and political conflicts that Bauman describes as a struggle for urban spaces (1998). 10The main device used to limit and control the Roma presence in Rome is the concentration in separate and ethnically connoted areas: “campi sosta” (halting sites) or “campi nomadi” (nomad camps); this housing policy derives from the identification of the Roma as “nomads”, but, as many scholars demonstrated, this category has to be considered misunderstanding and inappropriate both for the Roma who came to Rome from former Yugoslavia, mostly originating from cities and urban contexts, and for those coming from Romania, who have a long history of forced sedentarization, imposed by the communist regime and, earlier, by the system of slavery4. Regardless of the people living inside, the focus of the policy-makers has always been on the camps: the new ones to be built after having identified areas where protests are unlikely to break out; the already existing ones, to be renovated or, more often, to be shut down within the context of urban re-qualification5; the unauthorized ones, shanty towns made of wood and cardboard which cause widespread indignation against what is seen as urban degradation. 11The focus on Roma camps was further reinforced in May 2008 when Berlusconi's newly elected government declared a “State of Emergency concerning the presence of Nomads camps”6. In this document the Roma presence is compared to a natural disaster that calls for extraordinary measures, and camps are explicitly defined as an emergency and a risk for the security of citizens. In order to control and limit the presence, the declaration requires an ethnic census of the Roma people living in authorized and unauthorized camps, and assigns new powers and functions to the Prefects, who became Special Commissioners for the Emergency. This national framework allows local authorities to easily intervene both in the authorized and unauthorized camps by planning new ones, and transferring, relocating and evicting others. 12This is the broader context in which Gianni Alemanno, the mayor of Rome elected in April 2008 after an electoral campaign in which he criticized the previous left wing administrations for their “weakness” and their “useless and dangerous tolerance”7, began carrying out his new policies toward Roma people. 13The guidelines of Alemanno's policies were presented in two programmatic documents: the “Nomads Plan”, made public in August 2009, and the new “Camp Regulations” issued some weeks before8. 14The “Nomads Plan” first provides an overview of the number of Roma present in the city; 7177 people, located in more than one hundred settlements. These data were collected thanks to several censuses and initiatives to collect photographs and identify the Roma residents, which took place in various periods. Next, the Plan focuses on Roma settlements, that are classified in three categories: authorized, tolerated and unauthorized. As regards the 80 unauthorized camps, with a total population of at least 2200 people, the Plan simply schedules their demolition, without planning any further support for their inhabitants. Roma people in Rome would subsequently be allowed to live only in the thirteen “authorized” camps9, for a maximum of 6000 inhabitants. The settlements which had so far been tolerated would also be progressively shut down. This goal of only thirteen camps would be met by creating three new camps, and by renovating some of the authorized ones in order to increase their capacity. These structures, re-organized according to the guidelines spelled out in the “Camp Regulations”, would immediately host the inhabitants of the three tolerated camps on which the local government had first focused its attention: Casilino 900, Tor de' Cenci and La Martora. The Plan contains no clear schedule concerning the other “tolerated” settlements10. 15For our purposes, the most important elements contained in the new ”Camp Regulations” concern the sections dedicated to control and to the re-organization of social services. The feature which has caused the strongest reactions is the introduction of a “Document Authorizing Temporary Stay” (DAST), a special identification card which is required in order to live in, and even have access to, an authorized camp. To obtain it, a person must hold a regular permit to stay or to prove the continuity of his/her residence in the city over ten years. In other words, a regular legal status is the conditio sine qua non to enter the authorized camps. Furthermore the DAST is valid as long as the inhabitants follow the rules imposed by the “Camp Regulations” and actively take part in the projects of social inclusion and employment initiatives carried out in the camp. Rules concerning communal life in the camps are a tool borrowed from similar regulations introduced in Milan, which effectively establish a kind of double legislation for the camp inhabitants: a series of behaviours which would normally be considered legal, for example hosting guests or having a party until late at night, are considered punishable, the ultimate penalty for all illicit behaviours being expulsion from the camp. The Regulations put private security officers in charge of controlling the entrance, the space and the people inside and outside the camp, and using video surveillance devices. 16Finally the activities for social inclusion and vocational guidance, one of the biggest item of expenditure for the Municipality11, are to be coordinated and implemented by a socio-educational office inside the camp. These activities will be carried out by the Italian Red Cross under the control of local government and will substitute the non-profit sector. 17Considering these two policy documents, we can argue that once again the housing problem of Roma in Rome, that is the problem of housing people considered “nomads” through the dislocation and management of the camps, appears as the priority and the main dimension within which policies are elaborated. Thus, measures and problems related to employment and social inclusion have shifted into the background of policy development. 18This focus on the spatial issue has led to a specific form of presence and mobility of the Roma within the city: as the map clearly shows12, in the last thirty years local policies, in the form of evictions and transfers, have forced Roma to move, pushing them beyond the city borders. This has cleared some parts of the city from a presence felt as dangerous and indecorous in a mechanism of “urban hygiene” that often hides urban renovation programs and real estate interests (see infra note n. 4). 19The latest and most mediatized movement of ‘nomads’ within the city was produced in February 2010 by the eviction of Casilino 900, a legal camp in the eastern suburbs of Rome. A focus on this eviction will permit us to analyse the gap between policy plans and concrete practices, revealing some of the hidden consequences of the policy, and then to evaluate the new forms of interaction between the Roma and the local authorities. 20During the electoral campaign of Spring 2008, both the two main candidates for mayor, Rutelli for the left wing and Alemanno for the right wing, concentrated their attention on the Roma issue and especially on the destiny of the Casilino 900 camp. They both called for its eviction, at times underlining the dramatic housing conditions of Roma, at other times supporting the on-going protests of residents in the neighbourhood. 21Casilino 900 was one of the last Roma settlements still inside the city perimeter13. Placed at the borders of Centocelle, surrounded by the Casilino Park and several important roads such as via Palmiro Togliatti and via Casilina, the camp was located in an urban zone with no clear intended use. It was a Roman example of terrain vague, a result of the absence of municipal intervention and of the historical presence of marginal people14 and activities, such as junkyards. Approximately 600 Roma of several nationalities lived there, mainly coming from the West Balkans. Some of them, such as the Kosovans, arrived in Rome after the long sequence of conflicts which dismembered the former Federal Republic of Yugoslavia; others, such as the families from Bosnia Herzegovina, settled in the city, and particularly in this part of it, in the late 1960s. 22In the camp the different national origins were reflected in the organization of the internal spaces, with specific groups and bare familije living in distinct areas15. The most visible and alarming fact was the dramatic hygienic conditions of the whole settlement: most of the dwellings had been self-built, sometimes very solidly, but there were no regular floors, nor basic infrastructures, such as a water supply, toilets, lighting and electricity, making the area unhealthy, if not dangerous. 17 G. S., Roma man living in Casilino 900, interviewed on 27 March 2010. 23In the last years associations and inhabitants of the camp organized many protest initiatives, and they also planned projects to improve the housing conditions16, but only when mayor Alemanno was elected did the local government concretely tackle the whole situation of the settlement with the longer-term objective of evicting it. In summer 2009, Alemanno's government financed the installation of drinking fountains, some minimal lighting and toilets and, at the same time, as many Roma remember clearly, police carried out many controls on the inhabitants, creating an atmosphere of fear and insecurity among the Roma17. From that moment on, the mayor committed himself personally to the Casilino operation, stating that the respect of the rights and the dignity of the people was possible only if legality and urban security were assured18. In this scenario, personnel of the local government started to negotiate with the inhabitants about the timing and procedures for the eviction. 24This long preparation process was accomplished during the political campaign for the election of the Regional Council in Lazio. On the 19 January, 2010, Alemanno, together with the Special Commisioner Pecoraro, the Councillor for Social Services Sveva Belviso and some Roma leaders, started the eviction operations which ended some weeks later with the destruction of the last shacks, the drainage of fields and the symbolic delivery of the area to the neighbourhood residents. In front of many TV cameras and journalists, the members of the local government defined it as a historic turning point and gained the full and unconditional support of the Roma leaders who had witnessed the eviction. Also for these leaders the eviction of Casilino 900 represented the starting point of a new season in which degraded living conditions, as well as irregularities and criminality, would no longer be tolerated. Roma leaders also underlined that what had just begun was a new era in the relationship between Roma communities and local authorities, repeatedly stating that Alemanno was the first mayor to enter the camp in order to directly witness their living conditions, the first mayor to shake their hands and take charge of their destiny19. 25Following the “Nomads Plan”, the majority of people evicted from Casilino 900 found accommodation in four authorized camps: camping River, via Salone, via Candoni and via dei Gordiani20. The first three camps are located close to, or beyond, the symbolic border of the city drawn by the ring road, in non-residential areas, far from public services. Each one of them already housed several hundred inhabitants. Despite the lack of space, all the camps were renovated in order to install new containers21. At via di Salone, containers were freed and, in the weeks before the arrival of the Roma from Casilino 900, a few dozens people were moved to Castelnuovo di Porto, a small town 10 kilometres from Rome, in a centre for asylum seekers. 26This last operation represents a significant change in urban policies addressed to Roma and highlights a central, but often neglected, consequence of the “Nomads Plan”. None of the Roma had previously ever been housed in such a reception structure, not even those escaping the conflicts in former Yugoslavia. Besides this, the new reception policy gave the Roma involved the chance to regularize their legal status as they could apply for the recognition of refugee status and benefit from the protection procedures addressed to this group of migrants. 22 See Perin (2011) for an analysis of the acknowledgement of the Roma as refugee or stateless. 27Again it was an exceptional measure within the policies for Roma people, because even during the war in Kosovo Italian government released only a limited number of temporary permits to stay for humanitarian reasons. It is a surprising novelty from a political point of view, considering that the right wing focused its political campaign on the need to evict and expel Roma, and from a legal point of view because the Roma involved had been living in Rome for over at least twenty years and many youngsters were born in the city22. 28This opportunity to regularize their illegal status is certainly one of the most important, yet little known, elements in the implementation process of the Nomads Plan. 29In the following weeks, this same opportunity was provided to all of the Roma evicted from Casilino and, then, to the Roma families living in those authorized camps which had to be evicted according to the “Nomads Plan”. Even in the police headquarters there are now ad hoc offices for a new category of foreigners, the “nomads/asylum seekers”, where only the Roma involved in the “Nomads Plan” are admitted. 30The creation of privileged channels to obtain a permit to stay has so far played an essential role in the negotiations between local government and Roma, although it only consists in the right to apply for regularization and provides no guarantees about the result of the application; moreover, any permit to stay would in any case only be temporary. A considerable number of Roma living in Rome, though they have been living here for years, still have an irregular legal status. Considering the recent changes in legislation enacted by the “Pacchetto Sicurezza”23, they are in a condition of permanent risk of expulsion or imprisonment. According to social workers and public officers I interviewed24, this new opportunity made the Roma’s attitude towards local government and police forces change radically: many Roma spontaneously asked to be photographically identified and to undergo a further census because they saw it as the only chance to apply for a permit to stay. Likewise the inhabitants of Casilino 900 accepted to move, leaving the Centocelle neighbourhood where they were living for decades and without knowing in advance where they would be relocated. 31Indeed, the new locations to which the Roma from Casilino moved soon showed their weak points: even though local authorities tried hard to relocate the families on the basis of nationality, religious confession and kinship ties, these new arrivals had to face the discontent of the other inhabitants of the camps who complained about the drastic reduction in space25. Almost immediately tension burst into riots and violence among the Roma themselves. 32During the weeks following the eviction, while media and local government focused their attention elsewhere, some observers noticed that several families evicted from Casilino 900 preferred to find different accommodation rather than move into the authorized camps. Some of them moved to those unauthorized settlements so far tolerated by local authorities26. 33The concrete results of this eviction in many ways contradict the public image of efficiency and legality which Alemanno's administration and several Roma representatives had tried to project concerning the “Nomads Plan”. 34In the months following the closure of Casilino 900, the implementation of the “Nomads Plan” decelerated: the Roma living in the Tor de' Cenci camp strongly opposed the hypothesis of being moved to the nearby Castel Romano camp. Through their protests, they obtained the promise that they would be transferred to the new camps yet to be built. During summer 2010 the camp known as La Martora was closed and its inhabitants were relocated to Castel Romano, 25 kilometres beyond the city borders, where more than 1200 persons live. Meanwhile, although local government has published a call for bids for the construction of new camps and has entered into negotiations with private businesses, it is not yet known where the three new camps which are necessary to accomplish the “Nomads Plan” will be built. 35Delays and contradictions concern the situation of unauthorized camps too: despite the Plan and the statements made by the mayor in several occasions, especially after the death of five children caused by accidental fires in August 2010 and in February 2011, many Roma still live in very dangerous conditions while the eviction program à la Sarkozy has gained a growing number of opponents, also within the Catholic organizations27. 36In this uncertain scenario, the Roma issue in the city is once again discussed by local authorities in terms of camps for nomads, the everlasting framework shared by right and left wing policies. Alemanno's policy toward Roma is, however, also the context within which brand new forms of political activism and participation of Roman Roma is occurring. 37The eviction of Casilino 900 can be considered the starting point of a new mode of interaction between Roma and local authorities. The visibility that Roma leaders earned in public debate and the systematic collaboration during and after the eviction represent a great change when compared to previous years. We will focus on the construction and the acknowledgement of a Roma leadership, and on the effects of its progressive cooperation with political authorities28. 38When the mayor decided to begin the Casilino eviction, he excluded most of the associations historically involved in this and in the other Roma camps from the negotiation talks, while only some Catholic organizations were involved in a consultative forum29. 39All the decisions about the transfer were made in direct talks between local authorities and some of the Roma living in Casilino 900; during this period Najo Adzovic, a Roma originally from Montenegro30, who had lived in this camp for decades, emerged as a leader31. 40Before the start of the negotiations, Adzovic was one of the Roma employed by Italian NGOs32 in the social programs carried out in Casilino 900. Although he joined some of the initiatives to improve the housing situation in the camp, he never had any representative role, neither for the whole camp nor for his bari familija. According to the Roma and gagè (non-Roma) informants33, when the local authorities started to negotiate directly with the inhabitants, Adzovic was the first to accept and adopt Alemanno's key words, echoing his discourse on legality and integration of the Roma and security for the gagè34. In doing so he was able to acquire a public role acting as the representative of Casilino 900 inhabitants, even though no elections had been organized. In the words of the Roma, he was described as the one who shook hands with and could directly speak to Alemanno. 41When the transfer was over, the Municipality openly encouraged Roma leaders to organize and act as partners. First, in November 2009, local authorities supported the creation of the “Coordinamento Roma Rom”, a committee aimed at gathering all the historic leaders of several camps; it would have been the main interlocutor of the Municipality for the implementation of the “Nomads Plan”, with two Roma associations at the forefront35. Then, in August 2010, the mayor nominated Najo Adzovic his delegate for the Roma issue, not a representative but a kind of consultant for local government. Finally, in Autumn 2010, the “Coordinamento” was recognized as the new partner, alongside the Red Cross, for the reorganization of the social programs addressed to Roma, definitively replacing the gagè associations36. In the meantime Adzovic played a key role in the public debate, becoming the spokesman and symbol of the new Roma policies implemented by Alemanno37. 42This kind of engagement and visibility of a Roma leadership constitutes a real novelty within the Roman scenario compared to previous years. 43If we extend our consideration to a national level, we can include this phenomenon within the broader framework of the evolution of Roma activism in Italy which has resulted in an increase in the number of Roma associations and, since 2004, in the creation of federations and associative networks. The common fundamental goals are Roma’s direct participation and their political representation, aiming at overcoming the mediation of pro-Roma gagè associations. Internal divisions and lack of an institutional interlocutor have obstructed this process on a national level. 44At a local level Roma’s increasing participation can be interpreted as a consequence of the empowerment of some Roma representatives, such as Najo Adzovic, who, have managed to become independent from the non-Roma associations that bred them. 45What has been different in the Roman scenario is the pivotal role played by Alemanno in the construction and the acknowledgement of a Roma leadership: the mayor excluded Italian NGOs from all the negotiation talks, and he chose and recognized de facto Najo Adzovic and some of the other members of the Coordinamento as the main partners for the implementation of the “Nomads Plan”. 46This mechanism of construction and acknowledgement of a Roma leadership appears similar to what some scholars have highlighted when analysing migrants' participation in other Italian local contexts (Grillo 2006, Però 2007, Mantovan 2007). Quoting Mantovan, we can define it as “a pattern of co-optation of individuals migrants carried out by local institutions and NGOs, that clashes with the construction of solidarity among immigrants and is connected to the weakness of and the fragmentation of their associations” (2007, p. 320 my translation). Also the top-down process carried out in Rome is dependent on the role played by local institutions who create exclusive channels of interaction for the diverse migrant communities identified on the basis of their national or ethnic origin. A relevant difference from what the above scholars have discussed, though, is the absence of NGOs and civil society in the empowerment process of a Roma leadership in Rome38. 41 M.B., social worker, interviewed on 15 November 2010. 47This mechanism had some consequences on the role and the possibility of action of the Roma leaders. On the one hand, they had to accept, and become the spokesmen for the guidelines of Alemanno's policies for Roma. In other words, Najo Adzovic and the other members of the Coordinamento had to reframe their discourse about Roma’s situations in Rome, endorsing the demand for legality and urban security coming from right wing parties, and criticizing those associations within which they were trained39. On the other hand, the members of the Coordinamento I interviewed40 openly declared that they had not taken part in the policy conception phase, while they were directly involved in the operative phases of the “Nomads Plan”. For example, Najo Adzovic and some other Roma elders living in Casilino 900 could negotiate with local government on the timing and methods of the eviction, but they had no possibility of influencing decisions concerning their resettlement in other camps. A few months later, when local authorities started to deal with the Roma community living in Tor de' Cenci, Adzovic was involved by the Municipality to communicate and make the Roma accept the government's choices, acting as a spokesman of the Municipality or, at least, as a facilitator41. 48It is important to underline a further element of weakness of this Roma leadership. It is evident that behind these leaders and spokesmen there is not a political debate infra Roma groups, not a common position shared by all the Roma communities in the city, nor is there a mobilization which transcends the destiny of a single camp and the related negotiations42. Even the “Coordinamento” cannot be considered a representative forum of Roma in Rome, because none of the members was elected as representative of any community, and only one of them comes from one of the biggest Roma communities in the city, the Romanian Roma43. 49The absence of structural connections between the Roma leaders who can deal with the local authorities and the diverse communities of Roma living in Rome emerged very evidently in April 2011. After a period of eviction of unauthorized settlements, a group of Roma from Romania, supported by a few Italian NGOs, entered the Basilica of San Paolo seeking asylum in the Vatican. During this unprecedented form of Roma unrest, none of the official leaders intervened, neither in joining or defending them, nor in mediating with the Municipality. Their silence demonstrated that from their point of view these Roma, and their struggle against evictions from unauthorized settlements, were something other, highlighting a new line of separation between the Roma living in the camps, who could deal with the Municipality and appear in the public debate, and those who had to remain invisible and unrepresented44. 50This kind of selection of a Roma leadership in Rome and its action within the wider political process can be compared to the rise of many Roma leaders and Roma NGOs in the European scenario, a phenomenon recently analysed by Trehan (2009) and Nirenberg (2009). In both cases, single Roma leaders could finally reach the control room accepting the framework, the goals and the priorities elaborated by gagè, and drifting away from their grassroots. So, even if they are publicly recognized and legitimated by local authorities, Roma leaders are obviously subordinated to them, confirming the structural inequality that historically characterizes the relationship between gagè institutions and Roma groups, and biasing the political (and leadership) dynamics on the ground. 51Standing in this position, the emerging Roma leadership was able to obtain important results, for example about the permit to stay and the engagement of Roma associations in the reorganization of social services, a relevant opportunity to earn money for Roma. On the other hand, these goals could be achieved only because the leadership adhered de facto to Alemanno's choices. 52The local policies towards Roma people carried out in this “emergency era” are often presented by policy-makers as the organic plan that finally solves what they define as the Roma problem in the city. The main goal they want to achieve concerns urban security, a key word that has become pivotal not only in the Roman or Italian political debate45. 53Right wing policies, in continuity with the previous left wing government, try to achieve this goal by concentrating the Roma in a decreasing number of authorized camps, whose dimensions are increasing and where new practises of control and exclusive social aid are located. 54In this political scenario what appears as a novelty is the participation of Roma leaders in that process. As the eviction of Casilino 900 clearly shows, the visibility and legitimacy they earned in the last years seem to depend on the fact that they accept camps as the only solution provided by the institutions for the accommodation of the Roma in Rome. So we can affirm that the possibility for Roma leaders to act and speak as subjects in the political arena is limited, following Spivak (1988), by the impossibility of shaping a different image of themselves, because they participate in the process in which “individuals (Roma leaders) constitute themselves in terms (nomads) of the norms through which they are governed” (Shore and Wright 1997: 9). 55In this context, Roma leaders’ visibility and participation could be defined, similarly to the previous experience of migrants’ participation in local scenarios, as a “governmental tool for social cohesion and status quo maintenance” (Però and Solomos 2010, p. 5), strengthening a multidimensional separation of the Roma from Italian society. AA. VV., 2007, Modello Roma. L’ambigua modernità, Roma, Odradek edizioni, 192 p.
ABÉLÈS, M., 2001, Politica, gioco di spazi, Roma, Meltemi, 144 p.
ADZOVIC N., 2005, Il popolo invisibile, Roma, Palombi, 108 p.
BAUMAN Z., 1998, Globalization: the human consequences, New York, Columbia University Press, 136 p.
BRUNELLO P. (edited by), 1996, L'urbanistica del disprezzo. Campi rom e società italiana, Roma, Manifestolibri, 312 p.
CINALLI M., GIUGNI M., 2011, Institutional Opportunities, Discursive Opportunities, and the Political Participation of Migrants in European Cities, in MORALES L., GIUGNI M. (eds. ), Social Capital, Political Participation and Migration in Europe: Making Multicultural Democracy Work?, Houndmills, Palgrave, p. 43-62. CLOUGH MARINARO, I., 2009, Between Surveillance and Exile: Biopolitics and the Roma in Italy, Bulletin of Italian Politics, vol. 1, n° 2, p. 265-287. CLOUGH MARINARO, I., 2003, Integration or marginalization? The failures of social policy for the Roma in Rome, Modern Italy, vol. 8, n° 2, p. 203-218. CLOUGH MARINARO, I., DANIELE U., 2012, Roma and humanitarism in the Eternal City, Journal of Modern Italian Studies, vol. 17, n° 1 (forthcoming). DAL LAGO A., 2004, Non-persone. L’esclusione dei migranti nella società globale, Milano, Feltrinelli, 280 p.
DANIELE U., 2010, Censimenti e razzializzazione della differenza zingara nell'era della sicurezza, in LOMBARDI SATRIANI L. M. (ed. ), RelativaMente. Nuovi territori scientifici e prospettive antropologiche, Roma, Armando, p. 92-99. DANIELE U., 2011, Sono del campo e vengo dall'India. Etnografia mobile di una collettività rom ridislocata, Roma, Meti, 244 p.
ERRC, 2000, Campland. Racial segregation of Roma in Italy, Budapest, ERRC, p. 57. FRA, 2009, Housing conditions of Roma and Travellers in the European Union, Luxenbourg, October 2009, 116 p.
GRILLO R., 2006, Immigrazione e politica del riconoscimento delle differenze in Italia, in GRILLO R., PRATT J. (eds), Multiculturalismo all'italiano. Le politiche di riconoscimento delle differenze, Bologna, Guaraldi, p. 27-58. GUY W. (edited by), 2001, Between past and future. The Roma of Eastern Europe, Hatfield, University of Hatfield Press, 429 p.
KARPATI M., 1988, I fatti di Roma – rassegna stampa, Lacio Drom, n°1, p. 5-68. KLIMOVÀ-ALEXANDER I., 2005, The romanì voice in world politics: the United Nations and non-state actors, Aldershot, Ashgate, 195 p.
LEGROS O., 2011, Réguler la société par l'espace ?, Lignes, n° 34, p. 161-178. LOY G. 2009, Violino tzigano. La condizione dei rom in Italia tra stereotipi e diritti negati, in CHERCHI R., LOY G. (eds. ), Rom e sinti in Italia tra stereotipi e diritti negati, Ediesse, Roma, p. 13-50. MANTOVAN C., 2007, Immigrazione e cittadinanza. Auto-organizzazione e partecipazione dei migranti in Italia, Milano, Franco Angeli, 336 p.
MARTA C. 2005, Relazioni interetniche: prospettive antropologiche, Napoli, Guida, 256 p.
MARUSHIAKOVA E., POPOV V., The Gypsy Court in Eastern Europe, Romani Studies, vol. 17, n° 1, pp. 67-101. NIRENBERG J., 2009, Romani political mobilitazion from the First International Romani Union Congress to the European Sinti and Travellers Forum, in SIGONA N., TREHAN N. (eds), Romani Politics in Neoliberal Europe, London, Palgrave Macmillan, p. 94-115. PERIN G., 2011, L’applicazione ai Rom e ai Sinti non cittadini delle norme sull’apolidia, sulla protezione internazionale e sulla condizione degli stranieri comunitari ed extracomunitari, in BONETTI P., SIMONI A., VITALE T. (eds. ), La condizione giuridica di Rom e Sinti in Italia, Giuffré, Milano, p. 363-414. PERÒ D., 2007, Inclusionary rethorics, exclusionary practises. Left-wings politics and migrants in Italy, New York- Oxford, Berghahn Books, 168 p.
PERÒ D., 2011, Subjects of policy: construction and contestation. An introduction, in SHORE C., WRIGHT S., PERÒ D. (eds. ), Policy words. Anthropology and analysis of contemporary power, New York – Oxford, Berghahn Books, p. 223-227. PERÒ D., SOLOMOS J., 2010, Migrant politics and mobilization: exclusion, engagements, incorporation, Ethnic and Racial Studies, vol. 33, n° 1, p. 1-18. PIASERE L., 1980, Il sistema di parentela e il parentado cognatico dei Rom Xoraxanè, L'Uomo, vol. 4, n° 1, p. 49-84. PIASERE L., 1991, Popoli delle discariche: saggi di antropologia zingara, Roma, CISU, 216 p.
PIASERE L., 2004, I Rom d'Europa. Una storia moderna, Bari, Laterza, p. 144. PIASERE L., 2006, Che cos'è un campo nomadi ?, Achab, n° 8, p. 8-16. PRESSMAN J. L., WILDAVSKY A. B., 1973, Implementation. How great expectations in Washington are dashed in Oakland, Londra, University of California Press, 215 p.
SHORE C., WRIGHT S., 1997, (edited by), Anthropology of policy. Critical perspective on governance and power, London, Routledge, 294 p.
SIGONA N., 2005, Locating the ‘Gypsy problem’, Journal of Ethnic and Migration Studies, vol. 31, n° 4, p. 741-756. SIGONA N. 2009, The ‘Problema Nomadi’ vis-à-vis the Political Participation of Roma and Sinti at the Local Level in Italy, in SIGONA N., TREHAN N. (eds), Romani Politics in Neoliberal Europe, London, Palgrave Macmillan, p. 272-291. SPIVAK G. C., 1988, Can the subaltern speak?, in NELSON C., GROSSBERG L (eds), Marxism and Interpretation of Culture, Basingstoke, Macmillan Education, p. 66-111. TOSI A., 2011, Le politiche abitative per i Rom e i Sinti, in BONETTI P., SIMONI A., VITALE T. (eds. ), La condizione giuridica di Rom e Sinti in Italia, Giuffré, Milano, p. 791-804. TREHAN N., 2009, The Romanì subaltern within Neoliberal European civil society: NGOization of Human Rights and silent voices, in SIGONA N., TREHAN N. (eds), Romani Politics in Neoliberal Europe, London, Palgrave Macmillan, p. 51-71. VERMEERSCH P., 2006, The Romani movement. Minority politics & ethnic mobilization in contemporary central Europe, New York - Oxford, Berghahn Books, 280 p.
VITALE T., 2009, Politique des évictions. Une approche pragmatique, in CANTELLI F., ROCA I ESCODA M., STAVO-DEBAUGE J., PATTARONI L. (eds), Sensibilités pragmatiques. Enquêter sur l'action publique, Bruxelles, P.I.E. Peter Lang, p. 71-92. VITALE T., BOSCHETTI L., 2011, «Les Roms ne sont pas encore prêts à se représenter eux-mêmes!» Asymétries et tensions entre groupes Roms et associations «gadjé» à Milan, in BERGER M., CEFAÏ D., GAYET-VIAUD C. (eds), Du civil au politique. Ethnographies du vivre-ensemble, Bruxelles, P.I.E. Peter Lang, p. 403-429. 1 See Vitale and Boschetti 2011, Vitale 2009 and Sigona 2009. The first two papers analyse concrete interactions between Roma, public authorities and NGOs on a local scale, while Sigona focuses on the electoral campaigns, considering both the visibility of the Roma issue and their political participation. 2 In the field of policy studies, the research published by Pressman and Wildavskydel (1973) is considered a turning point. 3 I have been doing ethnographic research on the Roma issue since 2004. I initially focused on the situation of an authorized camp which was moved in 2005 after twenty years of existence (see Daniele 2011). I then began to work in unauthorized camps, the shanty-towns created within the most recent Roma migration influx, and I thus had to address the new legal measures for Roma people issued by Berlusconi's government. 4 The birth and the main characteristics of “campi sosta” as a specific device for Roma people considered as “nomads” had been widely studied in the literature, both in the Italian tradition (Tosi 2011, Piasere 2006, Marta 2005, Brunello 1996) and in English publications (Clough Marinaro 2009, 2003; Sigona 2009, 2005), while the living conditions inside the “camps” have been reported by many international organizations (FRA 2009, ERRC 2000). Given the space limitations of this article, we will assume that the main criticisms within this literature are well-known, especially those regarding the inappropriate and misunderstanding use of the term “nomads”. 5 In the recent history of the Roma in Rome we have two examples of this: the camps located in vicolo Savini, next to San Paolo Basilica, and in Campo Boario, in the Testaccio neighbourhood, were evicted after 20 years of stable presence on those territories. In this long period, the areas where the camps were located increased their value as all those located next to the city centre. In both cases, the displacement of the Roma was considered the first step, and the conditio sine qua non, for the implementation of urban renovation projects carried out by state actors, such as the Municipality and the University of Rome 3, which were planning interventions in those neighbourhoods. See Daniele 2011 for an analysis of the history of vicolo Savini camp. 6 It is possible to find an analysis of the Declaration of State of Emergency and the census of Roma people in Daniele 2010 and Loy 2009. 7 See Alemanno's electoral program, available in the website www.giannialemanno.info (last accessed 15/12/2010). 8 Both the documents are available on line; the Nomads Plan in the website of the Municipality (www.comune.roma.it, last accessed 20/02/2011), and the Regulation in the website www.prefettura.it/roma (last accessed 20/02/2011). 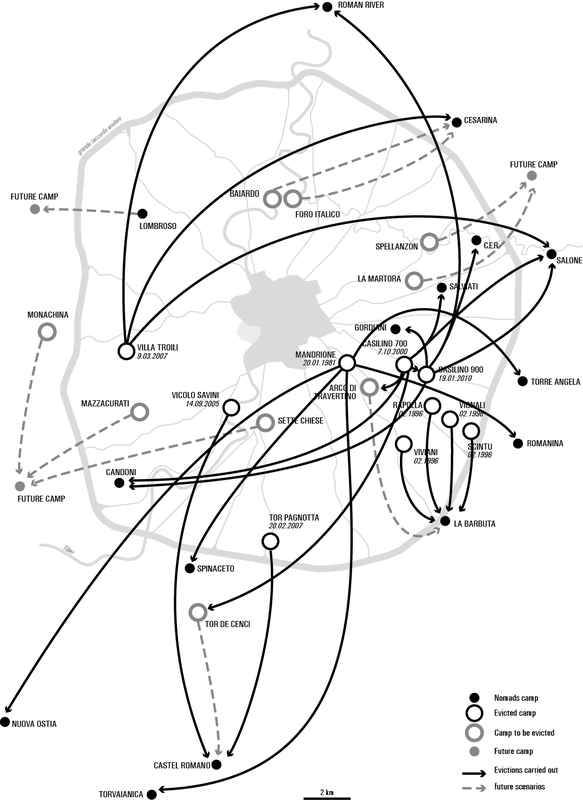 9 The camps of Via di Salone, Via dei Gordiani, Camping River, Via Candoni, Castel Romano, Via della Cesarina, Viale Lombroso, Via Ortolani, La Barbuta, Via Salviati, plus the ones to be built. 10 They are the camps of Arco di Travertino, Baiardo, Foro Italico, Dameta, La Barbuta, Monachina, Naide, Ortolani, Salviati, Sette Chiese, Spellanzon. 11 Since 1991, the Municipality has paid Italian NGOs for the cleaning and maintenance of the camps, and for the schooling of Roma children. More than two hundred workers are employed each year in these activities, mostly on fixed-term contracts. The amount of the grant is about three million Euros per year. 12 The map was created by Giacomo Zanelli within the research project “Nomadism and the city” carried out by DIPSU, Faculty of Architecture, University Roma Tre. 13 As the map shows, most of the authorized camps are actually located next to or beyond the urban ring road (Grande Raccordo Anulare) that is considered the symbolic border of the city. This road runs beyond the peripheries that were built during the seventies and the eighties. The administrative area of the Municipality is still larger and includes many residential areas which have grown along the main arteries leading into Rome during the city’s most recent sprawl. See AA.VV. 2007 for an analysis of the new geography of Rome. 14 The Roma arrived until 1960 settled in an area where hundreds of migrants coming from the South and the Centre Italy built one of the many shanty-towns which surrounded the city. In 2000, during Rutelli's administration, they were displaced from Casilino 700, an area closer to the city centre, to Casilino 900. 15 “Extended families”, composed of various nuclear families living in the same settlement or area. According to Piasere (1980), residence is the main characteristic of such a group, while consanguinity, economic or migration strategies have to be considered as flexible criteria. 16 It is not possible in this circumstance to give a list of these events and demonstrations. We will cite as an example only the last and best known event: the construction of Savorengo Ker – meaning “everybody's house” in the Romani language – built by some of the families of the camp with the help of students and professors of the faculty of Architecture of University Roma Tre. It is possible to find documentation about the history and the failure of this initiative on the website www.reterom.blogspot.com/ (last check 20/02/2011). 18 Clough Marinaro and Daniele (2012) carried out an analysis of what they called a “new humanitariasm” for the Roma in Rome. 19 These comments and statements were reported in various newspapers. See, for example, the local pages of “Il Messaggero”, “La Repubblica” and “Il Corriere della Sera” in the days of the beginning and the end of the eviction (19-22 January 2010, 14-16 February 2010). 20 Some of the residents of Casilino 900 who refused to be moved to other camps, were placed in a Temporary Emergency Center for Roma (CER) located at the border of the city in the eastern periphery. 21 “Container” is the term commonly used to refer to the structures provided to Roma families in most, but not all, authorized camps in Rome. These do not have heating systems, but there is electricity and running water. Despite the small dimensions, about 20 square meters, usually up to six persons live in a container. 23 The “Pacchetto Sicurezza”, approved by the Berlusconi government on 23 July 2008, contains a series of amendments that modify several laws, in particular the Unified Act on Immigration. Among many famous and controversial changes, it allows the imprisonment for up to six months in Identification and Expulsion Centres (CIE) of immigrants without a regular permit to stay; recidivism is punished with detention in state prisons. 24 E.g. A.A., social worker, interviewed on 15 October 2010, G.L.R. social worker, interviewed on 20 October 2010, M.B., social worker, interviewed on 15 November 2010, M. H., Roma man living in unauthorized settlement, interviewed on May 29 2010, G. S., public officer employed at Department of Social Affair of the Municipality, transcription of an informal communication, June 6 2010. 25 The camp in via Candoni is a particularly remarkable case. In winter 2009 work began in order to create the space necessary to put the containers assigned to the Roma moving from Casilino 900. The new containers occupied the area where the other residents had until then parked the vans they use to collect metals, that is one of the few ways they have to earn money. Before the works began, the local authorities promised that some of the old residents, especially the youngest and recently formed families that were still living with their parents, sharing very little space, would be given new containers. However, when it was clear that none of them would receive new containers, their resentment increased rapidly, some of the new containers were seriously damaged and the works had to start anew. 26 Some NGOs also stated that the Municipality was not able to assure that all the minors moved from Casilino 900 were registered in schools, so many of them could not complete their school year. 27 The mayor of Rome, together with the French government, asked to modify EU directive n.38 which regulates the right of movement of European citizens, with the goal of reducing the influx of Roma people from Romania. 28 This section develops some arguments previously presented at the “Conference on Contemporary Rome: Changing Faces of the Eternal City” hosted by The American University of Rome on 26-27 November 2010. 29 Some of these Catholic associations, such as A.C.L.I. or “Comunione e Liberazione” have little or no experience in the Roma issue. After a few months, the “Comunità di Sant'Egidio”, involved for decades in activities for the Roma people, left the negotiations criticizing the principles and operation of the Nomads Plan. 30 In 2005 Adzovic published an autobiography focusing on his experiences during the war in Yugoslavia and talking of his arrival in Rome. 31 According to the licterature, Roma leaders who deal with gagè are not the only authorities within their communities (Piasere 1991, Marushiakova and Popov 2007). Even within the camps, questions concerning relations between families are solved through the intervention of elder members of the community, or by the calling for a kris or judicata, an ad hoc court of justice. 32 I include in this formulation all the pro-Roma associations which were born and developed within the large Italian not-for-profit sector that carried out numerous activities for Roma people in the last decades receiving funds from the Municipality. A brief list includes: Opera Nomadi, ARCI Solidarietà Lazio, Hermes and F.O.C.U.S. - Casa dei Diritti Sociali. These associations were also the context within which some Roma representatives were selected and trained and had the chance to build their experience as social workers or community leaders, establishing contacts with public services and administrative personnel in the city. 33 For example J. H., Roma woman living in Casilino, interviewed on 15 March 2010, and F. M., social worker, interviewed on 23 March 2010. 34 See Dal Lago (2004) and Però (2007) for an analysis of the birth and the spread of these key words within the political agenda of the right and left wing parties, especially at the local level. 35 These are Nova Vita, run by Najo Adzovic, and Romà Onlus, founded by Graziano Halilovic, one of the leaders of the Coordinamento. In the early phase leaders from seven camps joined the Coordinamento; all of them had been employed by Italian NGOs in the previous years and acted as representatives when dealing with the previous administration. 36 The Municipality is now dealing directly with Roma and Catholic organizations to reorganize social programs within the camps. To date it has not been carried out because of the protests of many Italian social workers who risk losing their jobs. Furthermore the Municipality is continuing negotiations with the Italian NGOs previously involved who have credits with local administration. 37 Najo Adzovic intervened explaining or defending Alemanno's policy in public occasions, such as the presentation of a Report published by Amnesty International on 11 March 2010, and on national television, such as during a debate with Letizia Moratti, mayor of Milan, broadcast by RAIUNO on 27 August 2010. 38 See Clough Marinaro and Daniele (2012) for an analysis of this communitarian approach which characterize the Italian Right parties. 39 In a long interview Najo Adzovic stated that: “We used to work with several associations, but their policy is one of solidarity, not of aiming to make the Roma more responsible for their own lives. In the last 10 or 15 years they received millions of Euro in public grants to create the camps but not to move beyond them. Now these associations have to go away […] Roma deserve a better life, but they have to became more responsible. Those who deserve trust, by making their children go to school, looking for a job, earning a regular salary, can be helped to get beyond the camps. We will need years: the community itself has to throw out the drug dealers, those who steal or profit from the forced prostitution of women or from children begging”(my translation). The interview was published in “Reti Solidali” (n. 1-2/2011) and it is consultable on the web site http://volontariato.lazio.it (last accessed 28/6/2011). 40 G. H. interviewed on 6 May 2010, E. C. interviewed on 13 October 2010, members of the Coordinamento. 42 Following Article 2.3 of the new Camp Regulation, in July 2011 the Municipality organized the election of representatives of the Roma living in the camp located in via di Salone. According to the Camp Regulation, these representatives will be involved with other administrative personnel in the management and in the control of the camp. So, the power and the possibility of action of these elected leaders is limited within the camp, the exclusive – and excluding – political arena created for the Roma by gagè institutions. 43 Furthermore, after a beginning phase in which many Roma from different communities joined the Coordinamento, a lot of members decided to leave it because of its hazy aims which make it depend on the agenda of the Municipality. Interviews with E. C., Rumanian Roma, and B. H., Roma leader, President for a few months of the Coordinamento and, then, founder of Committee “Ex-Casilino inhabitants”, 20 November 2010. 44 Another moment of strategic positioning of this Roma leadership occurred within the national political scenario. When the Italian Red Cross was strongly criticized by migrants' and Italian associations and left wing movements for its role inside the CIEs (Identification and Expulsion Centre), the Coordinamento wrote a letter expressing solidarity and gratitude to the Red Cross which, in previous months, had carried out the census of the Roma in Rome. This way the Coordinamento clearly chose to not link its struggle to those of other immigrants, and preferred to reinforce the connection with those institutional actors that were playing an important role in Roma policy. The letter is available in the website http://www.crocerossachepassione.com (last accessed 20/6/2011). 45 Referring to the most recent fluxes of migrants towards Europe, Però and Solomos affirm that “[they] are increasingly excluded and criminalized by the mounting neo-assimilationist and increasingly xenophobic public discourse and policy which are replacing those of recognition, accommodation and tolerance of cultural diversity typical of multiculturalism” (2010, p. 5). Ulderico Daniele, « 'Nomads' in the Eternal City », Géocarrefour, Vol. 86/1 | 2011, 15-23.